Advent is a season observed as a time of expectant waiting and preparation for Jesus’ birth celebrated on Christmas Day. The term is a version of the Latin word meaning “coming”. Advent is the period of four Sundays and weeks before Christmas. There is a lot to do in the weeks leading up to Christmas and sometimes this “busy-ness” overwhelms the feeling of expectation and wonder. Here are a couple ideas to take time to pause during the season of Advent. You can have an Advent wreath and take time to light a new candle each week. There is a lot of symbolism with the Advent wreath. The wreath is a circle that symbolizes the eternity of God and the lit candles bring the light of Christ. 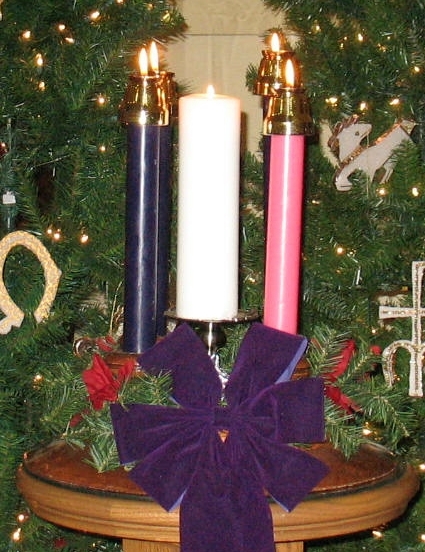 Traditionally the wreath includes three purple candles, one pink candle, and the white candle in the center. You can choose your own combination of colors though. 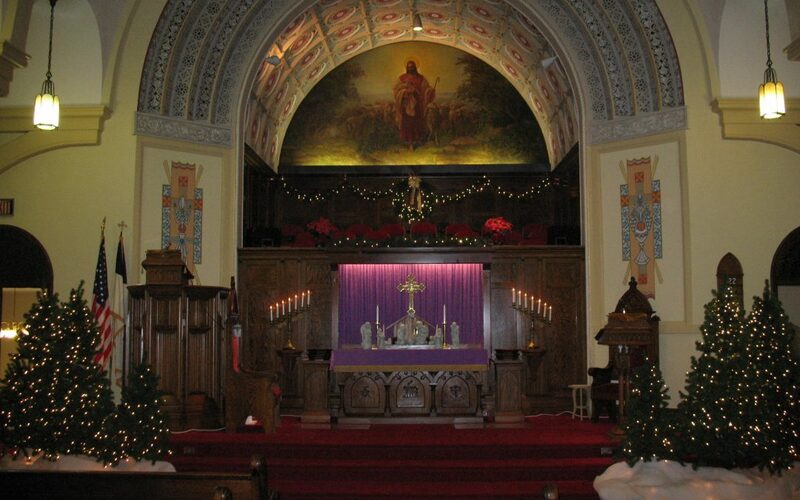 Each Sunday the church lights a new candle in the Advent wreath. These are the readings we are using each week that you can use at home or modify so it works for your family, such as splitting up the readings between family members or adding a favorite Christmas carol to go with each candle. During suppertime can be a good time to light the candles. O Holy Spirit, You whisper in the darkness and summon the light. You call us together to praise you. God, stir us to life. Open our eyes to your light and clear our voices. Today we light one candle. We light this candle to proclaim the coming of the light of God into the world. Together we keep watching and waiting for you, O Holy Spirit. May we know your love in the light that shines in the dark. Amen. The wreath is a circle with no beginning or no end, it is a symbol of God’s love which has no beginning and no end. Every week we light a candle to mark our watching and waiting for Jesus to come into the world on Christmas. Today we light two candles to help us keep watching and waiting for Jesus to be born. Amen. O God, maker of darkness and light, you come into the world an awaken our compassion. On this day, come into our hearts and turn them toward you. 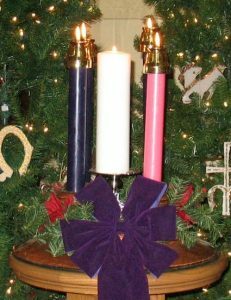 Today we light two purple candles and one pink candle representing the joy Mary felt at Jesus’ upcoming arrival and the joy we feel at Jesus’ coming. Pour out your blessing on this light.We rejoice that your light keeps breaking into the world. Together we keep watching and waiting for you. Amen. Today we light four candles to proclaim the promise of God’s light coming into the world. Together we keep watching and waiting for Christ. We light these candles as we prepare to bring our gifts before God. May the light of this fire stir awake our deep gladness. May this joy stir awake our generous giving. Praise God for the light! May this light be what we carry into the world. Amen. On Christmas, we come together as God’s people. 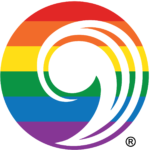 We join people of all times and places who gather in celebration. All the candles are lit! Today we light the Christ candle. We rejoice in the light Christ brings to the world. We thank you, God, for coming into the world to go with us. Your name, Emmanuel, means that you are with us. Make us a people of light and love as we rejoice in your promise born to us all. Amen. An Advent calendar is a special calendar used to count the days of Advent in anticipation of Christmas. The Advent calendar was first used by German Lutherans in the 19th and 20th centuries. There is a new update to this daily Advent calendar that reminds you to do something nice for others each day. You can create your own using a simple grid to come up with your own ideas or there are many examples online. One example can be found here. There are many options and reminders about giving back at the end of the year. We gather diapers to give to families in need. The average child will use more than 2,700 diapers in the first year alone, which can add up to more than $550 depending on the cost of diapers.